The Rockland Sunshine 4-H Club meets the first Monday of every month@6:30 P.M. at the Rockland Town Hall, 615 Milwaukee Street, Collins. 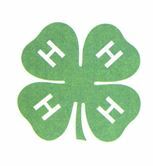 4-H is a nationwide organization for youth from kindergarten to one year out of high school. The purpose of 4-H is to provide real-life experiences through a fun, action-oriented, practical program. 4-H members play an active role in their communities. Members exhibit their projects at county and state fairs. For more information contact Nicole Duchow @ (920)772-4166 ; cell:( 920)- 323-6052 or the UW-Extension @ (920)683-4169. EVERYONE IS WELCOME TO JOIN! !